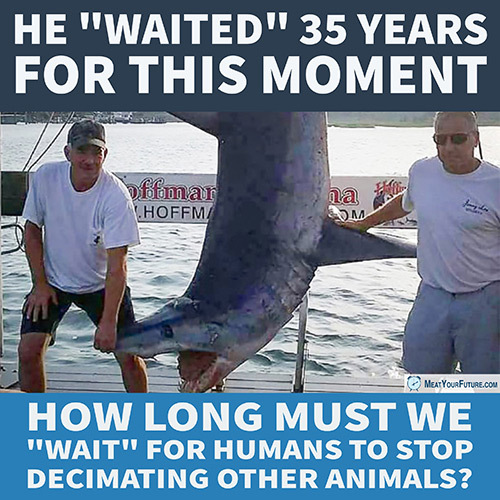 Man Waited 35 Years for "Big" Shark Catch | How Long Must We Wait? A fishing crew in New Jersey caught a 12 ft, 926 lb shortfin mako shark, apparently the “biggest” catch in the history of the state. The owner of the boat said he had “waited 35 years for [the] moment”. But how much longer can we “wait” for humans to stop decimating other animals? Already, since 1950, a staggering 90% (NINETY PERCENT!!!) of all large predatory fish in the ocean have vanished. And we’re still KILLING MORE THAN 10,000 SHARKS EVERY SINGLE HOUR, primarily due to our global appetite for “seafood” as sharks (and countless other aquatic animals) are killed en masse as non-targeted “by-catch” in commercial fishing operations, for the shark fin trade, and in recreational fishing. Why must we exterminate these creatures who roamed the oceans since even before dinosaurs existed? Why must we exploit and harm every single species on the planet? Please just leave the sharks alone. Leave fishes alone. Leave animals alone. And that means, among other things, not eating them.